The most common long term debate in the dental world is whether braces or Invisalign straighten teeth the best. In today’s age, orthodontic treatments have advanced in versatile forms of improving the functionality and appearance in one’s smile. The looming question clouding everyone’s thoughts all pegs down to one simple question, which one is best suited for you? Throughout this article, we will reference the pros and cons of both methods and help you get the most out of your smile. The integral aspect of both braces and Invisalign focuses on realigning your teeth and correcting your bite to its optimal oral health. While both methods differ, braces and Invisalign function as independent systems to complement your smile with straighter teeth. Traditional metal braces combine the functionality of high quality stainless steel to a minimalist aesthetic. Braces are also widely known for its metal brackets and archwires to adjust your teeth without any discomfort. Invisalign is more famously branded for its clear custom made aligners for every individual. Each clear aligner integrates an unconventional form of comfortable and removable aligners to accommodate straightening teeth. The benefits of straightening your smile without the cumbersome entanglement of wires around your mouth make a certain stand out against braces. Invisalign offers an opportunity to those who prefer an unnoticeable treatment while offering removability to your convenience. Invisalign’s technique embraces a more beneficial and modernized approach to aligning your teeth for a beautiful smile. While there are various benefits to Invisalign, its downfalls cannot go unnoticed as only specific teeth malformations qualify for this procedure. Invisalign also faces its limitations to realigning severe malocclusions and misalignments. The removability of Invisalign may be known for its most alluring benefit but can be its own worst enemy as it increases the risk of delaying your orthodontic progress. Braces have continuously been transformed over the years to be more comfortable and effective to each patient. Traditional braces entice suitable candidates in moving teeth as well as correcting overbites and under bites. While Invisalign lacks its adaptability, wired braces endorse its pliancy in adjusting teeth and malocclusions much more effectively. Despite these benefits, braces are infamously known for their visible appearance and disadvantages to complementing types of foods. A list of restrictions on certain foods and drinks, in order to avoid damages, can be displeasing to those who love to indulge in a wide array of cuisines. Discomfort and pain are also one of the commonalities of using braces as wires or brackets may cause friction to your gums. 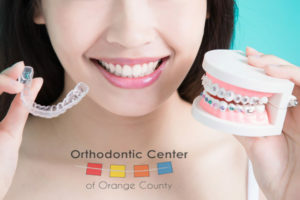 Distinguishing which treatment is best for you can be troublesome; luckily, Orthodontic Center of Orange County ensures you attain the smile of your dreams. Take the first step and schedule a consultation with one of our doctors to find the right solution for a better smile.